Early this January, The Working Capitol hosted a packed house of people coming together to combat climate change through powerful film, meaningful action, and delicious ice cream. This event pivoted around a screening of Before the Flood, the 2016 National Geographic documentary chronicling Leonardo DiCaprio’s tenure as the United Nations Messenger of Peace for climate change. The film is full of powerful images as DiCaprio bears witness to the effects of climate change throughout the globe. Picture DiCaprio, standing in a pool of melting arctic ocean ice in big rubber boots, dumbfounded. Throughout the movie via voiceover, DiCaprio’s self-consciously reflects on his position as celebrity climate spokesperson. His passion is strong, but as a guide he stands in more as an everyman, often flummoxed by the gargantuan problems and devastation he confronts. The project makes a strong case that addressing climate change can no longer be a game of chicken between the world’s greatest superpowers who also happen to be the biggest contributors to the problem. When DiCaprio arrives in Indonesia by helicopter surveying the endless fields of cleared forest replaced by palm oil crop, I sensed a collective intake of breath in the audience. He hit close to home, drawing a clear link between the burning practices of Sumatra’s farming and the wide range of consumer good products—from chips to shampoo—that make use of cheap palm oil. After the film wrapped The Wedge Asia founder and the evening’s host Stephanie Dickson asked for a show of hands: Who felt energized, and who was terrified by the message? The scenes about the beef industry made me regret my already guilty indulgence of the McDonald’s Happy Meal I’d had for lunch. I felt defeated comparing the poignant scene of Obama reflecting on the effects of the Paris Agreement with the manic montage of climate change deniers from US congress who have been empowered by this election. The impetus for the event came from Liv Lo, yoga instructor and eco ambassador, who was so struck by Before the Flood that she was kept up at night for weeks, mulling over what she could do about climate change. Realising that a logical first step was to bring the film to more people in an empowering context, she roped in The Wedge Asia. To round out the screening, The Wedge assembled an experienced panel of change-makers to discuss how they were each pushing green boundaries and tackling the issue. In Singapore, we’re used to carrying around a scarf or an extra sweater for those chilly indoor climates. In fact, according to a poll conducted by the #Up2degrees team with the help of university researchers, 97% of a significant sample of Singaporeans sometimes feel too cold in air-conditioned areas. Because of their advocacy efforts, all new nonresidential buildings in Singapore now have to target temperatures between 23-25°C in order to be green mark certified. Sandra Marichal, who led the campaign, shared that they went from idea—turning up our air-conditioning by just two degrees—to policy change in just 12 months. Their success relied on enlisting not only the support of the local government, but also partners in universities, the private sector, and even local aunties who became vocal and influential advocates for change. What made a big difference, she observed, was putting real, relatable numbers on the face of this change, in the form of savings on energy bills. 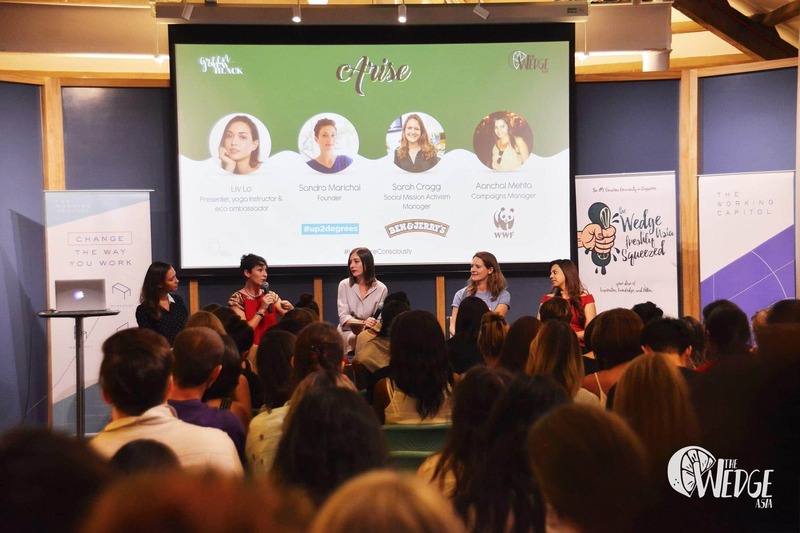 Ben & Jerry’s Social Mission Activism Manager Sarah Craigg shared how the ice cream brand’s foundational principles have guided both its product and its economic and social initiatives as it expands globally. For Ben & Jerry’s it’s not just about ice cream; it’s about a social mission. Sarah shared how the company is working to support existing social efforts in the region, inspired by the concept of “linked prosperity:” Anyone at any point in the supply chain who comes into contact with the ice cream, should benefit from the company’s success. This core commitment is also the driver behind the company’s sponsorship of many environmental initiatives here, including those of fellow panelists at the World Wildlife Fund and #Up2degrees. As for dairy farming’s climate impacts, Sarah described the number of ways Ben & Jerry’s proactively applies carbon taxes which then fund innovative pilot projects that focus on reducing waste and environmental impact. One Q&A commenter celebrated the all-female panel, but led to the question also on my mind: Judging from the turnout sustainability seems to be a field dominated by women, so what can we do to get men more involved? No one had a stronger answer than suggesting women should embrace the responsibility and lead the charge. Though we packed the room, the $25 entrance fee meant that it drew together a bunch of people privileged enough to be conscious consumers. Though Singapore’s global footprint is small, our consumption is outsized when it comes to things like imports, transportation, and other creature comforts of conspicuous consumption. Individually we can aim to live with greater awareness of our choices, but we also need larger-scale campaigns to reach both those in power and those in less privileged populations. Raising awareness about palm oil in consumer products, addressing inefficiency in raising cattle for food, and pressuring governments to hold themselves to Paris climate standards all require coordinated effort and attention from individuals and organizations alike. In the closing comments, a theme emerged: pick something you can do and make it a habit in your life. But this group of inspiring women certainly weren’t limiting themselves to the small scale. Their leadership in advocacy and nonprofit organizations gave us powerful examples of coordinated efforts with impact and reach beyond our individual spheres of influence. Check out The Wedge Asia on Facebook for future events and more conscious living resources. Also look out for EarthFest Singapore, coming up on February 12.